According to a recent study, “joining a meaningful group that meets just once a month produces the same happiness gain as doubling your income” (New York Times, David Brooks, March 29, 2010). You can get lifetime access to all the materials you need to start and run your own amazing Learning Circle for just $42. What is a Power of Families Learning Circle? 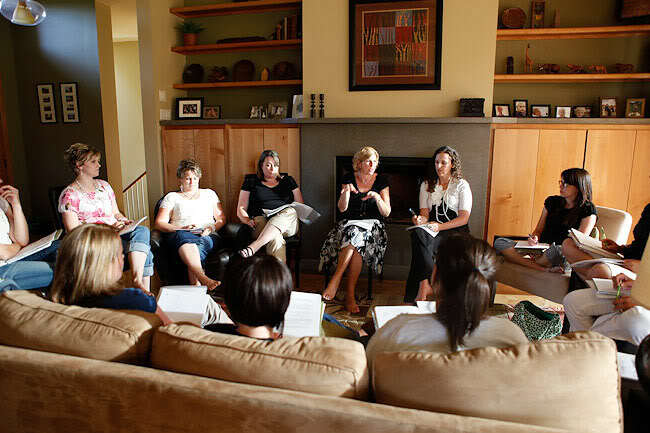 A Learning Circle involves 4-10 mothers who who gather every month to discuss their monthly reading assignment (a short but powerful article we provide) and support each other as they learn and grow together as moms and as women. While we offer many wonderful articles to all website visitors, the Learning Circle articles are reserved only for Learning Circle Members. These articles are a little longer and more in-depth than our regular daily posts and offer great examples, stories, practical ideas, discussion questions, and group assignments. Following is the list of topics–including one sample article. Click on the June article to an example of the reading assignments, discussion questions and assignments we provide for each month. June: The Power of Progress – Underneath the thousands of things you have to do or should do are the things that you were meant to do. This powerful meeting will help you stop underestimating your own power and enable you to really move towards your dreams in your personal and family life. Click here to receive your sample Learning Circle article, “Defying Gravity”, complete with discussion questions and take-home assignments! The incredible Learning Circle program, available exclusively through Power of Families, will offer you the support, ideas and fun you need in your life as a mom. We’d love to have you join us as a Learning Circle Leader or Member! Read through the following information for more details — or if you’re ready to get started, you can scroll to the top of this page to pay your lifetime Learning Circle membership fee and get things rolling. How do I pay my dues to join an existing Learning Circle I’ve been invited to attend? Simply scroll to the top of this page and add a Learning Circles membership to your cart and make your purchase! How do I start up and run my own Learning Circle? The Learning Circle Start-Up Kit: Detailed information, guidelines, and tips on how to set up and run a very successful, fun group. Also includes samples/templates for invitations, member organization, and e-mail reminders. 2. Start up your group. With help from the guidelines in the Start-up Kit, create a list of mothers who you think would really enjoy this monthly gathering and support. Use the email template provided to easily invite them to be part of your Learning Circle. Have each participant come to this page to purchase her lifetime membership fee. Once members are registered, they’ll have access to all the articles they need. Membership fees enable us to run this program and help ensure that participants will be committed. 3. Hold your Monthly Circle Gatherings. Rotate holding your monthly meetings at different Circle members’ homes, meet in your home each time if you want, or hold your meetings at a restaurant or other public place. Many groups enjoy cooking for each other and making each month’s meeting into a dinner party. Others enjoy rotating who brings some tasty dessert each time. Food always helps! 4. Keep things rolling with email reminders. About a week in advance of your meeting, you’ll want to remind everyone of the time and place and specify which article they should be reading to prepare for your discussion (using email templates provided or a Facebook group you set up for your Circle). 5. Connect, support, learn, and have fun. Laugh, eat, relax, and enjoy learning from other mothers who will become dear friends. This will be a monthly “shot in the arm” that will make a huge difference in your life! What are Learning Circle members saying about their experience? Q: How would I find moms to be in my Learning Circle? A: It really only takes a few mothers to create a wonderful Learning Circle. You invite a couple of moms, and they can each think of a couple of other moms–and you’re all set! Our Learning Circle Start-Up Kit has suggestions for how to find moms who would be interested in your Learning Circle. Chances are that even if you don’t currently have a group of “mom friends,” there are many mothers around you who are looking for just this sort of thing. Q: Do I need any kind of special experience to be a successful Learning Circle Leader? Q: What if a mother in my group moves away after paying her dues? A: She retains access to all the Learning Circle materials and can use those materials on her own in her new location or set up a new group in her area. If she does opt to start a new group, she can use the Learning Circle materials to get her group going and she’ll want to ensure that everyone in her group joins Learning Circles and gets their own access to the Learning Circle materials. Q: What if I buy the materials and get a group together but people don’t want to continue with the program? A: If you get a group together, hold your first meeting, and people don’t want to pay their dues and continue with the group, we’ll refund your money. Q: What do I do when someone new wants to join my group after we’ve been running our Circle for a while? A: Each new member should pay her one-time membership fee upon joining (you can email her a link to this page where she can pay her dues). You’ll want to take time to introduce the new member at your next meeting and encourage her to catch up on the last couple of articles you’ve discussed. Then add Learning Circles to your cart, and after you pay, you’ll receive an activation link by email. That will enable you to have instant, ongoing, lifetime access to the Start-Up Kit and the Year I, II and III Manuals of Monthly Learning Circle Materials online. 1. Power of Families Learning Circles have been put together for the purpose of strengthening mothers everywhere. A Learning Circle, though supported by our organization, does not represent or speak for Power of Families. All opinions and ideas shared by group members or Learning Circle Leaders are the sole responsibility of that specific group. 2. Power of Families is not responsible for any accidents, arguments, or indigestion that might take place at Learning Circle Meetings. Let’s try not to get too wild and crazy out there, ladies…. 3. In order to remain true to the purpose and function of the Learning Circles created by Power of Families, each Learning Circle leader will establish her group by following the guidelines explained in the Learning Circle Start-up Kit. 4. The Learning Circle Leader will do all she can reasonably do to ensure that each person who attends the Learning Circle pays her one-time Learning Circle membership fee. 5. The Leader will not share materials to others wanting to start a Learning Circle but will rather encourage any interested parties to sign up and receive the Start-Up Kit directly from this website.